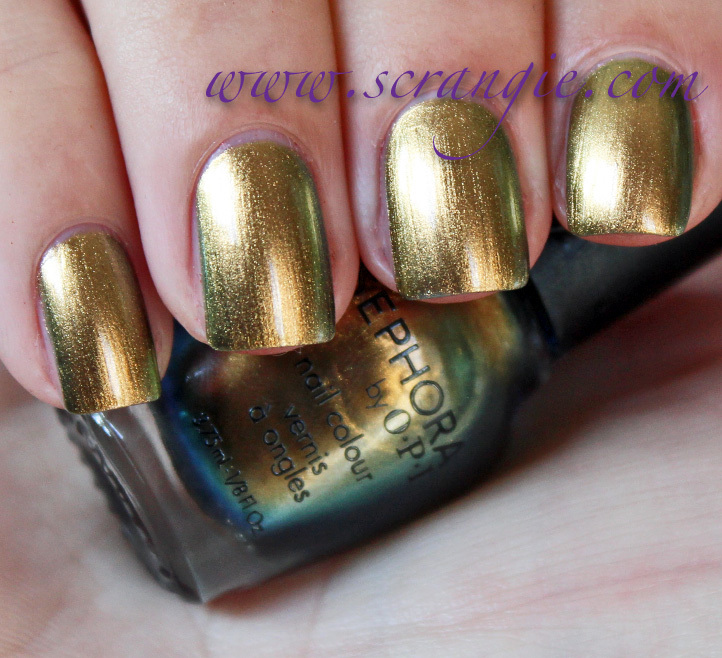 For some reason I'm really interested in Sephora by OPI polishes lately. I used to really dislike the formula when they first came out a few years ago, but lately they seem to have a bunch of really cool colors. Like these, for instance. These are awesome. Sephora by OPI I Think I Cayenne. Super rich, saturated, shiny rusty orange shimmer with iridescent orange micro-glass fleck particles. This color is perfect. It looks cool in the bottle, but it really shines on the nail. It's very orange and colorful, but it's a rusty autumn orange instead of the bright Tangerine Tango-style orange from summer. The shimmer glows in every type of lighting and the whole thing is just absolute autumn orange perfection. 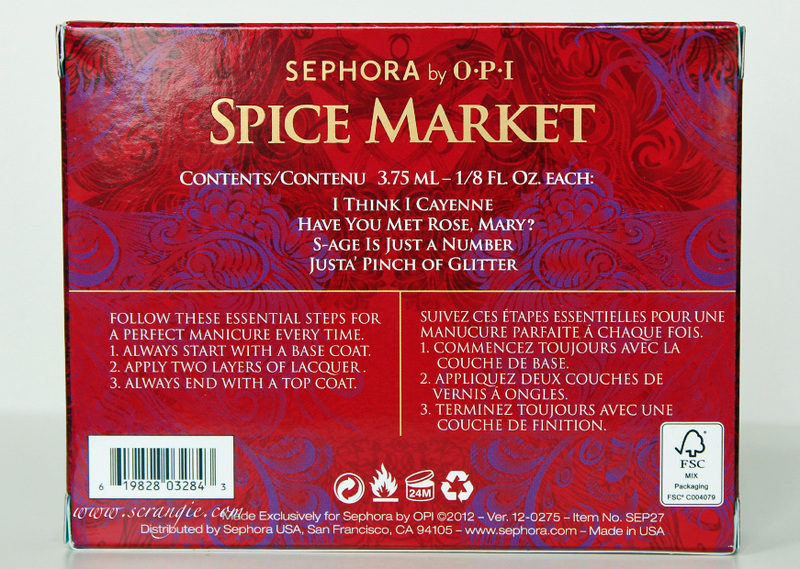 Sephora by OPI Have You Met Rose, Mary? Deep rose red shimmer with iridescent red micro-glass fleck particles. The glass fleck shimmer pearls in this and I Think I Cayenne are much smaller than most glass flecks in my collection, but they're just as shiny and light-catching. I originally wasn't sure about this color when I ordered the set, but once I saw it in person, it was love. Like I Think I Cayenne, this is a perfect fall color, but it could easily double as a Christmas poinsettia red as well. The glass fleck sparkle gives it more depth than an average red shimmer. Sephora by OPI Justa' Pinch of Glitter. Black, grey and silver microglitter and medium round silver glitter in a clear base. Interesting... I anticipated this being a dupe of China Glaze Some Like It Haute (and its dozens of clones), but it isn't. Justa' Pinch of Glitter is not holographic like Some Like It Haute, but the size, shape, color (apart from the holo), and density of the glitter is similar. 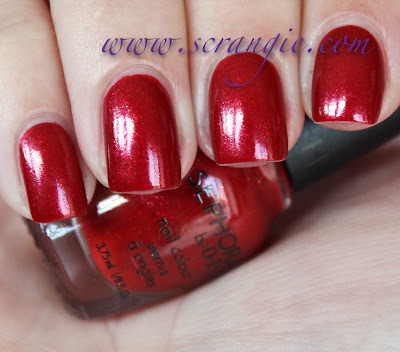 Sephora by OPI S-Age is Just a Number. Green/gold/blue chrome-finished multichrome. I knew this was going to be a Péridot dupe when I ordered it, but I was curious to try it out regardless. Good formula, nice strong color shift and excellent reflective shine, just like the original. Just a reminder that these are mini bottles in this set, and Sephora by OPI's minis are quite small. Usually mini versions of polishes are half the size of the full sized versions, but these are even smaller. The formula on all four shades was good. I had no problems applying whatsoever. The brushes in all were decent and provided a smooth, even application. Dry time was average. The three glittery shades look best with a coat or two of thick topcoat, but I find that the chrome one looks best without any topcoat at all. This set rocks. I'm glad I got it. Though, if I had the chance to do it again, I'd just buy full-sized bottles of I Think I Cayenne and Have You Met Rose, Mary?. I like all four colors, but I have plenty of Péridot dupes and I can live without the grey glitter; the orange and red are the standout shades for me. 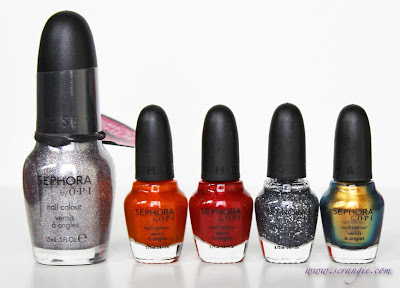 The only gripe I have about this set is the price- $19.50 seems like a lot for such a tiny amount of polish. Otherwise, love it. 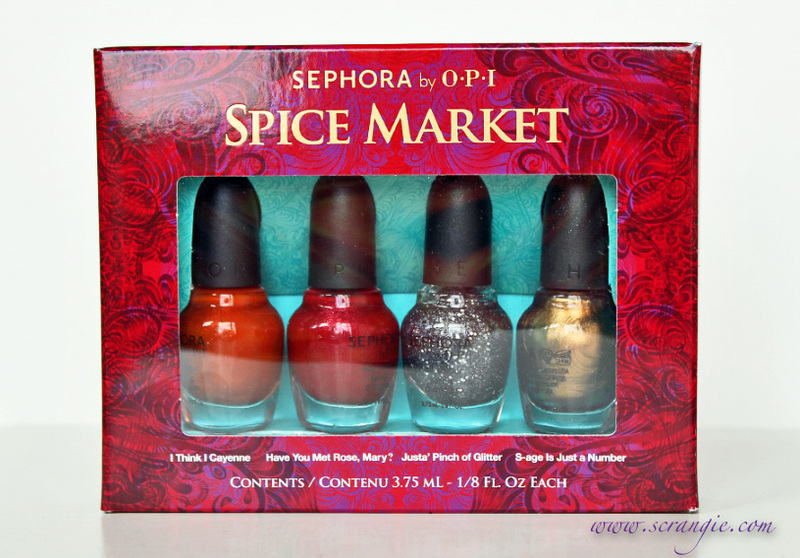 The Sephora by OPI Spice Market set is limited edition and retails for $19.50 for four 0.12 oz bottles. Love the glitter polish - it reminds me of stone. I bet it would look great matte. You're right! I think it matches my granite countertop, lol! I haven't mattified anything in a while, I think I need to try that. I really only like the first two, the ones you liked best also. But, I really, really like them!! Do these come separate on full size or just the mini pack, do you know? Because I'd really like to get just the orange and red ones. Also, how do you think they compare to the orange and red from OPI Germany? yeah, that pricing is insane. All 4 bottles don't even add up to 1 full size. $19.50 for less than a full bottle of Sephora by OPI? No thanks. Yeah, that pricing is insane. All 4 bottles do not even add up to the polish in 1 full size. So, $19.50 for less than 1 bottle of Sephora by OPI? No thanks. Wow, that is so true. I wouldn't have even thought of it like that. I was expecting them to be around 12 or 14 but when I saw 20 I thought that was a bit crazy! 20 dollars for not even one bottle of polish is nuts. I wonder what they were thinking when they put the suggested retail price. I kind of love the orange. Makes me want to go carve a pumpkin immediately. This set just screams fall! I'm usually not a huge orange fan, but I kind of want "I Think I Cayenne" on my nails right meow. Thanks for the great swatches! beautiful swatches, as always. i look forward to seeing them. i love the idea of the mini polishes because it's a nice way to sample multiple colors without committing to a full-size bottle, but wow the prices...i probably wouldn't splurge on this set even though it looks so enticing. I also love the glitter one, such sparkle!! How does Sephora by OPI I Think I Cayenne and Have You Met Rose, Mary? compare to Luxurious and Indulgence from the OPI Designer line? And If you had to choose between the 4 shades which 2 would you choose ( ie. I Think I Cayenne or Luxurious ;Have You Met Rose, Mary? or Indulgence)? Neither of them are dupes, and while I love all four colors, I'd have to pick the two OPI Designer Series ones. The Designer Series ones are so foily and sparkly and extra special. can't help but think I've seen the orange one somewhere before ... and S-age is just a number reminds me too much of Just Spotted the Lizard. Just a pinch of glitter would look amazing matt! will you post swatches? As soon as I saw I Think I Cayenne, it made me think of OPI Duetsche You Want Me, but I read in one of your earlier replies that they aren't exact dupes. Even still, since they are both by OPI I would hope for more diversified colors. However, OPI seems to be like the only line that came out with a burnt orange shade this fall- it just seems like such an appropriate color. Great swatches! I kind of like this collection! I have no problem owning another Peridot type, and the glitter and the orange are both very pretty. Funnily enough, I just swatched Ghina Glaze Riveting right before I read your post and it reminds me of I Think I Cayenne. They look like pretty close dupes. More similar than Deutsche ya Want Me Baby? IMO. I love "I Think I Cayenne"! I bought the full size bottle last week and couldn't stop looking at my nails. The orange was sooo satisfying now that the weather's turned a bit. I also got "Living In Cinnamon" from the same collection, and my husband loved it--he said it matched my hair exactly. I love the Peridot dupe! I agree. While I won't buy this one, like looking at it. It seems to have more blue shift than most of the Peridot dupes and not too much gold foil dumped into it. I have the same feeling over the bottle shape too. It seems huge and cumbersome. I bought a # of them when they launched the line but rarely buy them now. It's a similar thing about the bottle size/shape as is the Nicole by OPI bottle shape/size for me I think. 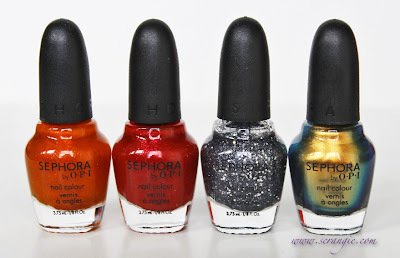 I also usually don't follow OPI for Sephora all that closely other than the first year it was out and maybe a few holiday polishes after that. But the first two here really have got me thinking I need to go get them. Like the new OPI DS polishes - here is another in a glowing orange and a glowing red. But I am always a sucker for those shades. I would wear this red all winter long. WOW. I really love all of these! Definitely will be buying. Justa' Pinch of Glitter reminds me a bit of Tinseltown from the 2011 China Glaze holiday collection just with larger glitter!